“Good for Otto,” David Rabe’s new play presented by the New Group Theater, was inspired by Richard O’Connor’s book “Undoing Depression.” As a general rule, the best plays are based on personal experiences, such as “Glass Menagerie” (Tennessee William’s mother and sister) or “Long Day’s Journey Into Night” (Eugene O’Neil’s family). Insights into depression in a self-help book doesn’t necessarily lead to great art. “Good for Otto” is interesting and very will performed, even if it is not one of Rabe’s better works. The central figure of the play Dr. Robert Michaels (versatile Ed Harris, here in a saintly mode) is the chief administrator at the Northwood Mental Health Center, who also functions as a therapist. The setup is reminiscent of the Vincente Minnelli film, “The Cobweb,” which also takes place in a mental hospital where the staff seems as unhinged as the patients. His chief patient a troubled 12-year-old girl named Frannie, who mutilates herself. Her foster mother (Rhea Perlman) wants to adopt her. Dr. Michaels identifies with the girl because he also had a rough childhood. His mother (Charlotte Hope) who still occupies his thoughts, killed herself when he was nine years old. Other patients include Timothy (Mark Linn-Baker), who has problems interacting with people but has a strong affection for his pet hamster Otto (the source of the title); Alex (Maulik Pancholy) who is gay; a compulsive hoarder (Kenny Mellman) and a suicidal young man (Michael Rabe), among others in the large cast. To calm himself and the others, Dr. Michaels lead everyone in singing sentimental old songs, such as “On Moonlight Bay” and “By the Light of the Silvery Moon.” You certainly won’t leave humming the scenery, which is basically made up of chairs. Scott Elliott gracefully directs the outstanding cast. 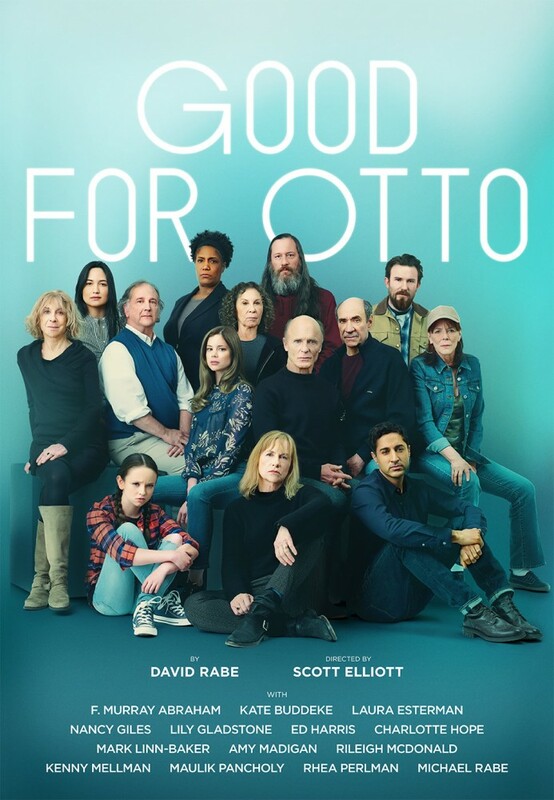 As for Rabe, “Good for Otto” is a world away from the violence of his early Vietnam plays. At almost three hours, the script could use some pruning. “Good for Otto” is running at The New Group at the Alice Griffin Jewel Box Theatre at Pershing Square Signature Center (480 W. 42nd St.; Tickets: 212-279-4200 or TheNewGroup.org). The run has been extended to April 15.